The Ottawa Police Service Robbery Unit and Crime Stoppers are seeking the public’s assistance for information that can lead to the identification of four robbery suspects. 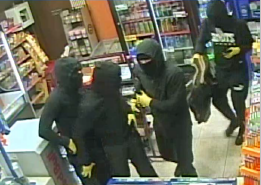 On the 27th of June, 2018 at approximately 01:52 am, four male suspects entered a gas station located in the 4700 block of Bank St. The suspects took cigarettes and cash. The suspects were masked, dressed in black and wore yellow gloves. A weapon was used during the robbery. The suspects fled south on Bank St. in a red vehicle, possibly a Toyota, unknown model. Please see photos below provided by investigators.